Alpine climbing and via ferrata, plus less intense high-alpine tours up to 4,000 metres, are what the all-around Women's Cevedale Pro GTX Boot is ready to take on with its ideal combination of stability, weight and upper flexibility. It combines Lowa's asymmetrical upper construction, FlexFit-Synchro, which allows the boot to move in tandem with the lower leg, and their Flex-Technology that reduces walking discomfort caused by stiff boot materials in the ankle and instep. The result? Comfort with traction and a superior feeling on the smallest of holds. The upper is made of a durable 2.4-millimetre suede leather. Patented, Lowa-exclusive I-Lock locking hooks supply absolutely comfortable adjustment of the two-zone lacing system. The waterproof Gore-TEx lining provides optimal comfort. The midsole Guida Pro midsole has a TPU Climbing Zone in the toe area and provides extremely high edging abilty. The proven Vibram Dolent outsole offers secure grip and edging. 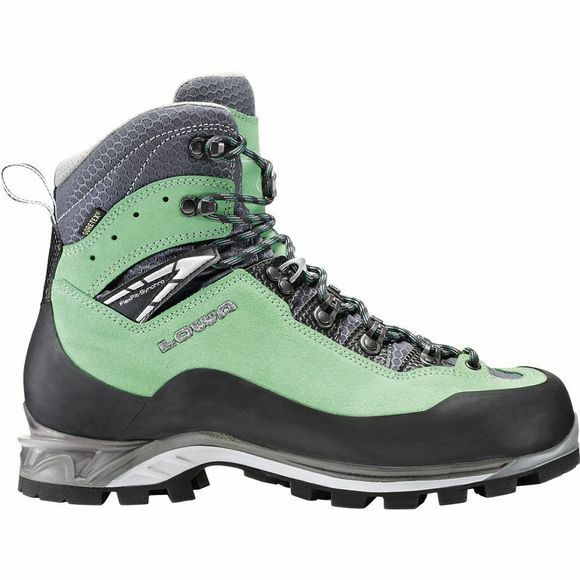 The Cevedale Pro GTX is also combination crampon-compatible.